So while I am waiting for my very own copy of Karl Marx’s Capital, Volume 1 to arrive in the mail, I figured I ‘d get to work (in the spirit of Frank Sobotka) on some ideas I have been playing around with for a while now. 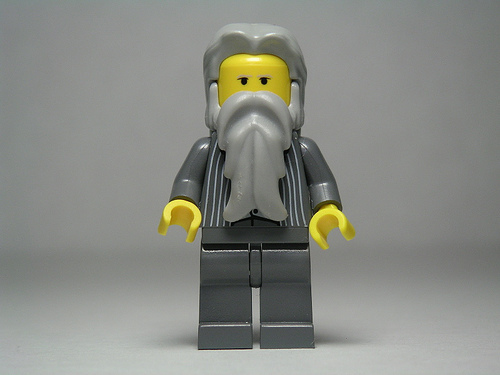 In short, how might you quickly create a syndicated framework for a a wide variety of loosely joined discussions around a course like the one David Harvey is offering up here? My first question when I initially saw this amazing resource was how would you capture the various traces of discussion surrounding these readings that might galvanize a intellectual community of ideas, activism, and critiques? I originally thought opening up comments on the actual blog where the videos are being published might be one way, but it occurred to me that it kind of centralizes the discussion around one resource, begging for a kind of interaction with professor Harvey that is not only unlikely, but impractical. Think of all the open resources out their right now, they come pre-packaged in iTunesU or some other anemic, branded delivery system that gives you the resource, but fails to actually frame any kind of community around the space. Learning does not happen within a tube of consumption, but rather through a series of relations within a community of engaged and excited thinkers. There has been a lot of talk about Do-It-Yourself educational technology, and I figured an occasion like this would give some of us the opportunity to really think about the possibilities and limitations of such a model. There is always a lot of theoretical talk about what we do or do not need, but I find a project like this helps me focus on praxis, a marriage of the technical details of what is currently possible, with the larger vision of what makes more sense and allows us to truly frame a distributed community for thinking, learning, and sharing together beyond the boundaries of any given classroom, institution, or geographically determined reality. Focus on explaining and documenting my thought process when creating a discussion hub like this using freely available, open source tools. In many ways it is working on the same model as UMW Blogs, but I have included some additional features like allowing anyone to add their blog’s RSS feed (or whatever other kind of site you are using that has syndication), anyone can signup for a blog, discussion forums, a wiki, and a twitter-like discussion space that I’m calling Discourse–that is simp;ly a theme that anyone could reproduce on this site or WordPress.com. Keeping my own skills in developing these spaces honed. Ever since UMW Blogs went live last Summer, the whole thing ran so smoothly I found I was spending a good amount of time shepherding communities on that site more than playing with the actual technologies. Which, by the way, is a more rewarding and effective use of my time. Nonetheless, I like thinking of the Summer as an opportunity to get a bit deeper into the general hacking of these open source applications to see what they can and cannot do. All that said, the site is still under construction. I will be finishing up the details over the next week, and will be providing in-depth documentation for using each element of the space. Also,there will be four more blog posts in rapid succession detailing the different, RSS-rich features of this syndicated framework, and why I choose to include them, and what they might provide in the way of discussion. I have to freely admit the site is overkill, but in many ways I needed that along with some honest critiques and discussion about this model so that we can keeping examining the possibilities without getting to mired down in the details. 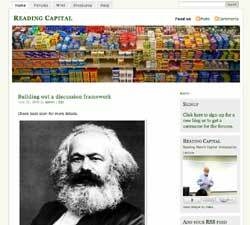 This entry was posted in Reading Capital, Uncategorized and tagged capital, community, david harvey, discussion framwork, DIY, karl marx, Reading Capital, rss, syndicate framwork. Bookmark the permalink. Of course it’s not either/or — you could still have the student blogs have posts that linked to specific parts and posts that didn’t, all posts would be aggregated, but those that linked to the text would show up as annotations via the magic of trackbacks…I just think it might integrate into the wordpress discussion better than the wiki…. That is an excellent example, and it could be just one more element here. The only reason I might avoid making that the space for a class, is because this isn’t really a class anymore. it is a series of resources freely available that any individual or group could come around and start interacting with in a wide variety of ways. For example, they could blog their reading, create a collaborative wiki article/essay, form a Ning group, tweet their progress, etc. So my idea is not to think of this in terms of a class, but as a space that is primarily concerned with aggregation, yet provides quick and easy tools like a blog or forum that people can use. 1) RSS and aggregation is currently the best and easiest way to frame a distributed discussion that is not specific to any one class or group of people. The tools here do a pretty nice job of demonstrating this process, and CommentPres is yet another way to skin this cat, and a really effective way I might add. 2) The power of owning their own work yet sharing it freely is best exemplified through a framwork like this. Sharing your RSS feed and brining your blog content into a specific community of people thinking about a similar text doesn;t force you to blog somewhere else, or joing yet another community, rather the place you live (be it a blog or some other publishing space) becomes your key to sharing freely yet maintaining your own work within a personal archive. It is on this last point where social/community sites seem to fail in this regard, you put your stuff in there, and often their isn’t an easy way to get it out. My point here is you should be demanding a publishing space where you can freely share parts of your writing via categories or tags with a resource like this so you aren’t doubling up effort and you can still maintain the space in which you do most of your work. Piggy backing on that sentiment, the inability to grab feeds for tags, categories, and authors is one reason why I am still disheartened with Ning, Blogger, and Typepad, for unlike WordPress these features seem absent from these services, making the ability to truly filter and feed select parts of your work all too difficult. Oh no, I completely agree with the aggregator part — I’ve been on board with that from the start. I think I’m just saying that rather than putting the *text* of of the book capital in a wiki, that CommentPress might be a better option, precisely for the reason that the tag-based aggregation is great idea — by putting the stuff in the CP architecture, comments I make in my *own* blog that reference the work become visible as trackbacks, which I don’t think happens on the wiki — on the wiki I have be a sharecropper on your wiki plantation, right. That’s my comment on that text, but it lives on my blog — I think this is what you’ve been doing with aggregation, just expanded. Does that make sense? I’m really only talking about swapping out the wiki version of the text for a CP site. The rest is very awesome and I plan to play around with it later this week. It’s quite possible I misunderstand the capabilities of the wiki as well though…. Sorry — I also realize I’m drilling down on a small point when I haven’t reacted to the thing as a whole yet which I love — which is what I get for trying to dash off quick comments in the middle of a workday. I will respond on the other stuff soon. Why would you ever apologize :), this is exactly the feedback I want. i am still trying to get my head around the framework, and think of others ways to publish and provide commentary is key. And you really point out a very important problem with this framework. The MediaWiki space just kind of hangs out there. I was originally thinking documentation, collaborative group spaces, essays, etc. But it isn;t anything that Wikipedia or some other wiki software can;t do better. I actually hadn’t considered republishing Capital in a MediaWiki site, in fact CommentPress would definitely be the way to go. I guess I am holding onto the MediaWiki install in anticipation of what the folks over at UBC are working on. A real way to take sections of a MediaWiki articles and republish them anywhere with a YouTube like embed code. All the better, the changes you make in the Wikipedia article are reflected in the post with the embed code. Very awesome for thinking about dealing with content management in distributed ways. So the MediaWiki is still very much an experiment that I am trying to wrap my head around, and keeping it in there, is definitely as much a part of habit as hope. So, in short, if my previous comment seemed like it was defending an idea, it has everything to do with trying to make sense of this space in order to truly work through to see if this is more a creepy tree house than a useful and lightweight syndication architecture.